← I took a day off (from blogging) and now I feel…bad (not really). 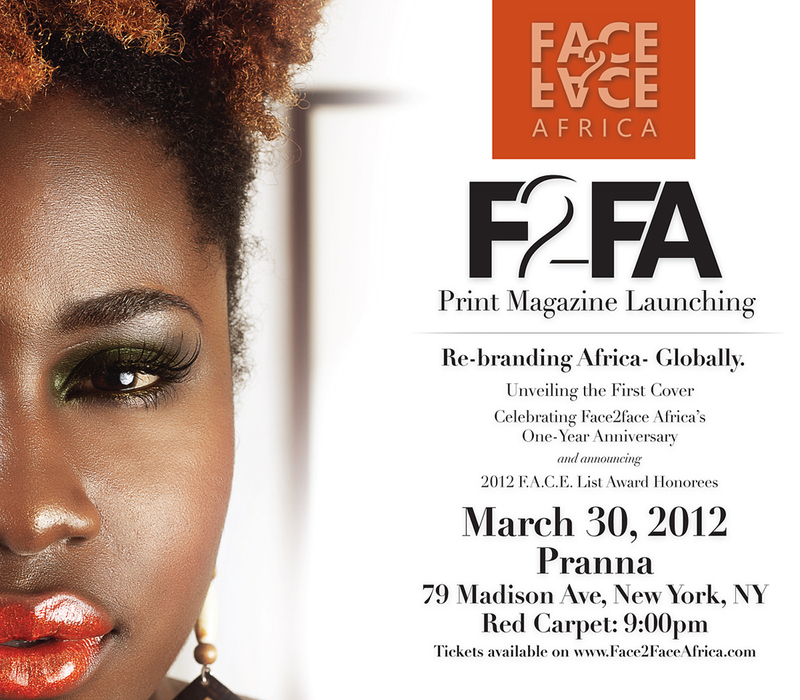 I’ve just been invited to a launch party for F2FA magazine, a globally distributed print magazine published by Face2Face Africa, launching in the spring of 2012. The launch party is next weekend, March 30th at Pranna Lounge, and I’m more than a little excited. F2FA or Face2Face Africa, is the brain child of Isaac Boateng and Sandra Appiah, two Ghanaian-born entrepreneurs, who wanted to put a new face (pun-intended) on how Africa is perceived. Face2face Africa, an online magazine launching in the first quarter of 2011 with a mission of Restoring Africa’s Image. The initiative was started by young Africans residing in the United States who realized that it was their time to make a difference in Africa. From my interaction with the founders, F2FA impressed me with a singular focus on their mission of reframing the perception of Africa and Africans. When I spoke to them a few months ago, during their search for the right person for their first cover, they described the F2FA magazine as a vibrant, multi-niche, high-end magazine. They wanted the magazine to be the vehicle which used creativity to explore the many facets of African politics, culture, entertainment, fashion, lifestyle, and the different methods Africans were employing to inspire change, progress, and development on the continent. Their online magazine currently features stories about African artists, musicians, designers, authors and standouts from all walks of African life. And if their online version is any indication of things to come, I’m confident that the print version will equally impress. The launch party next weekend promises to be a star-studded affair. Not that I’m in to celebrities. But we (my partners and I) were instrumental in getting the personality that graces the inaugural cover (I can’t tell you who it is, but they’re reeaaalllyyy popular), so I’m also excited for that reason as well. Although some would question the wisdom of publishing a print magazine when the big boys are folding and closing up shop, opting for digital subscription models, F2FA believes they’ve got a niche. And they are planning on releasing an app to satisfy readers who want to access F2FA magazine from the convenience of their mobile or tablet devices. So they’re definitely looking to cover all bases. If you’re interested in attending their launch event, follow this link to get your tickets. But you’d better hurry, they’re going fast! And make sure you stay up on F2FA…they’re the new face of Africa!